Have a utility model patents, played tight structure, form new, the overall compact, environmental protection and energy saving. The implementation of the national standard GB / T 14466 and SINOSTARS enterprise standards Q/WSS01-2004, is a national initiative. Body parts and materials, contact parts are made of stainless steel materials. Rack and electrical steel paint. Equipped with horizontal motor, body and motor One-piece construction with the axis of rotation. 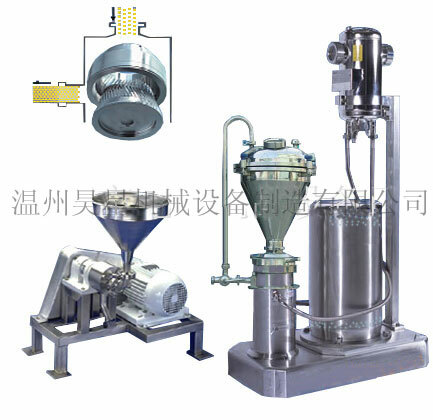 It is called Horizontal Colloid Mill; the use of piped connection method: flange, screw, quick clamp, quick, said living next thread pipelined Colloid Mill. Designing new, operation using a simple, convenient installation and maintenance, small size and high efficiency. Ultrafine particles for the wet grinding, crushing, emulsifying, mixing, dispersing, homogenizing, mixing and other high-performance features. Applicable to all types of emulsion liquid or paste media materials, processing materials, the density of 5000-10000 centipoise viscosity of the medium. Processing of materials in accordance with customers of different acidity, alkalinity, stiffness and other properties of special requests customization.